MAC ULEESHA 85U represents the very cutting edge of premier carcass genetics in the Salers breed. She comes from the first calf crop sired by MAC Seminole 58S, the very well-balanced MacDonald herdsire who combined an IMF ratio of 124 with the largest ribeye area scanned in MacDonald Ranches' entire 2006 bull calf crop. 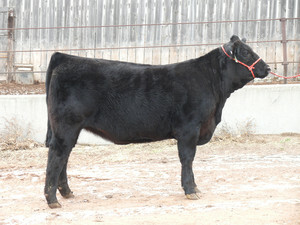 Her dam, MAC SUNRISE 168S, is a daughter of the breed's most proven high-marbling female - MAC BLACK FLORA 6F. 168S scanned with a ribeye area ratio of 108 and IMF ratio of 179 (actual reading of 6.36). 168S is also a full sister and flushmate to MAC F1 SUNDANCE 4S, a young herdsire who is working well in the herds of both MacDonald Ranches and Twin Valley West. As is typical of the Seminole daughters, ULEESHA is very feminine and attractive with lots of capacity and broodiness, a clean-made design and a great disposition. She promises to inject some of the top marbling genetics available in the the Salers breed into your breeding program and will also be an outstanding asset to add milk, productivity and pleasing phenotype.